Anyway, feel free to check the tab from time to time as I’ll keep it updated with each passing week. My goal for 2014 is to reach peak #90. “The road’s closed, so you’ll have to walk from here,” explained my white-gloved cabbie in a gentle tone that made the 2500 yen bill seem like nothing more than a small donation to a struggling musician. I was still several hours short of the trailhead, a lone, secluded walk on a crumbling forest road that would be anything but a gentle stroll. I shored up the trekking pole, pulled my pack straps securely around my thin torso, and got two steps into my traverse when a red sedan screeched to a halt directly behind. A middle-aged man rolled down the window, inquiring about the rope draped across the road in front of us. I sensed an opportunity, offering myself up for bait in our attempt to make it to the summit of Mt. Daru-ga-mine, peak #69 of the Kansai 100. I sat shotgun, serenaded by the sounds of Amazing Grace, Kumbaya, and other sacred hymns buzzing from the tape deck (!) of the outdated automobile. After lowering the rope, we cruised on a road that was 7 parts rock and 1 part concrete. Every several meters I jumped out and fulfilled my contractual duty by removing knee-high boulders out of the line of fire. We inched along the course like a family of carpenter ants in a sandbox. Wide-eyed hikers stood at the roadside and gasped at the spectacle of two rule-breaking comrades locked in a vengeful mission of greed. We passed by the first trailhead at Sugitani, opting to tempt fate by navigating the entire forest road to the terminus at Sencho-toge a few minutes south on the rolling ridge. Road conditions deteriorated in direct proportion to our altitude gains, until we picked our way through a maze of sharp rocks that threatened to put an end to our mission once and for all. I had my GPS on the entire time and instructed my driver to pull over and park at our current position. 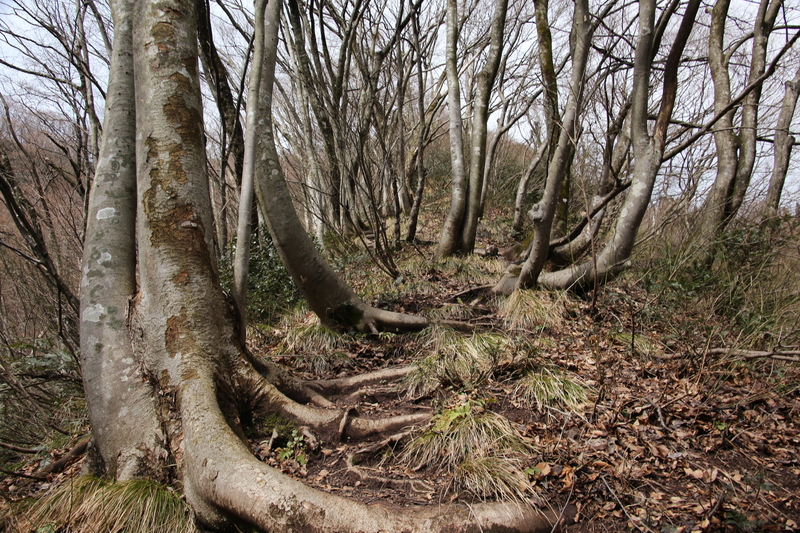 We were directly below the summit, a steep forest of beech and pine between us and victory. “Just follow me”, I instructed, forging a path in a dry gully lined with granite boulders floating in a dense sea of lime-green moss. The grade easily reached 60 degrees in spots, forcing you onto all fours in a sweaty battle with gravity. One unsteady foothold would send you sliding on your belly across the green oil-slick. There had to be a better way through the precarious maze, and fifty meters to my right I spied a patch of bamboo grass lining the edge of a spur off the main ridge. I signaled below and kicked a route into the softer ground. Progress was much smoother on the muscles but harder on the eyes, as each step forward would startle a snake out of its hiding ground, sending the pulse rate skyrocketing. At one point I nearly stepped on a gigantic black snake nearly two-meters long until I changed tack and tested the brush with my trekking pole first. This gave the reptiles a chance to slither away out of sight before I approached. After thirty minutes of this the angle finally eased a bit, bamboo undergrowth giving way to rhododendron and wild grass: we had gained the ridge and a bit further on, the trail itself. The two of us marched up the final rise to the exposed perch of Daru’s bald scalp. October winds blew in from the north, a reminder that autumn was advancing her march across the archipelago. I collapsed in a heap of sweat and exaustion, a heavy feeling forcing my body to the ground like a lead-filled wetsuit. I chose a fitting peak to match my darui state. A ridge of open grasslands stretched out before me. I’d be a fool not to do the full traverse, so I fueled up for the exhilarating stroll along the unobstructed meadows. Despite feel under the weather, I pressed on, reaching that trance-like state once your body reaches its full equilibrium. Before I knew it I was already 10 kilometers into my journey, perched on the final peak before the path dropped steeply along the edge of a golf course and down to the bus stop. I braced myself, tightening the laces on my boots and descended awkwardly like a sailor in a drunken stupor. I was so spent of energy I couldn’t even lift my thumb to hitch a ride back to the station. I reached the bus stop only to find that there was a two-hour wait until the next bus. It would be dark by then, so after downing yet another chocolate bar I braved the toxic fumes by stumbling through a two-kilometer long tunnel as quickly as I could before reaching the train station in a saturated, sloppy heap. Back in Osaka my lethargy led to a slight fever and extreme exhaustion. A couple of days later I stopped by a hospital and ended up being admitted with pulmonary tuberculosis, a disease that I had apparently been carrying for well over a year. And to think of the sheer number of peaks I had scaled with a stubborn bacteria slowly feasting on my lung tissue. 2013 started with a near-death experience and was ending with another fight with mortality. In the words of the mighty John Darnielle: “I’m gonna make it through this year, if it kills me”.